Shop Pioneer XDJ1000MK2 Professional DJ Multiplayer from AMS with 0% Interest Payment Plans and Free Shipping. On its own, as the foundation of your fledgling dream rig, or as the latest addition to any professional DJ setup - the Pioneer XDJ-1000MK2 Multiplayer has what it takes to get the job done! Part of a proud pedigree, the XDJ-1000MK2 inherits a number of attributes from the Pioneer Professional DJ lineup, including the highly popular CDJ-2000NXS2. Let’s begin with the impressive 7-inch, full-color touchscreen. This generously-sized tactile display provides not only high-resolution wave data, but timing, tempo, and other valuable information as well. There is even a pop-up QWERTY keyboard, allowing for fast and accurate track searches. Next, add an 8.1-inch jog-wheel offering both Slip and Reverse functions, plus an adjustable Vinyl Mode. Now layer on some Hot Cues, Quantization, Beat Jump and Search buttons – plus the Short Cut key – and you’ve got one of the most versatile performance players on the market. Through it all, the XDJ-1000MK2 remains easy to operate and intuitive in use, placing polished results at the fingertips of every performer. Best of all, the Pioneer XDJ-1000MK2 is fully compatible with rekordbox™ and the rekordbox mobile app. Use rekordbox to save, tag, and catalog your library of tunes, then save it all to a USB drive. Plug the USB flash drive into the XDJ-1000MK2 and let the performance begin. American Musical Supply adds value to your Pioneer XDJ-1000MK2 with free shipping, a free extended warranty, and a payment plan with 0% interest. By any measure, the focal point of the Pioneer XDJ 1000MK2 is the brilliant high-resolution LCD touchscreen. The current song name, musical key, track number, BPM, time remaining, and other relevant information is clearly displayed – along with the waveform display, current playback position, and beat grid markers. Measuring seven inches, this full-color display offers instant access to a myriad of on-demand performance features that keep the show moving. Here you can create and select Hot Cues and Loops, access the powerful Slip mode, and more – all by simply touching the screen. In addition to direct access to the Browse mode, the Short Cut key presents your own customized “My Settings” information on the screen for immediate editing. The addition of a pop-up QWERTY keyboard allows for streamlined searching, plus direct access to your rekordbox files, right from the XDJ 1000MK2. 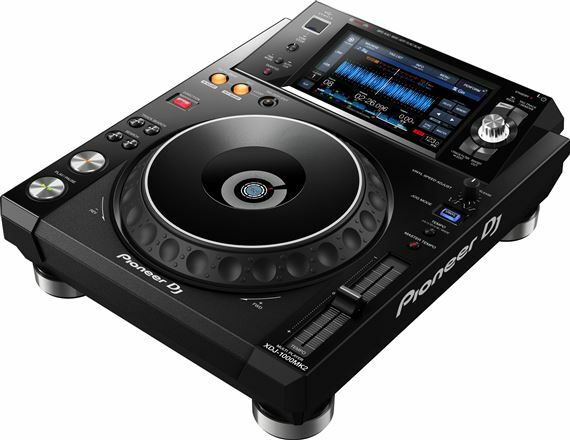 The Pioneer XDJ 1000MK2 is equipped with a capable jog-wheel measuring 8.1 inches and offering both side-edge finger grips and illuminated on-deck status indicators. The adjustable Vinyl Mode offers a retro touch, while Reverse and Slip options add to your performance tool kit. Search and Track Search buttons allow you to quickly move forward or backward through the song or set list to find just the right spot. The Tempo slider offers a four-position scale setting for pinning down the perfect feel. In addition to the standard stereo pair of RCA audio outputs, the Pioneer XDJ 1000MK2 also features a coaxial digital audio output. The analog power supply is completely isolated from the digital circuitry to keep noise levels at an absolute minimum. Support for studio-grade FLAC and ALAC formats has been added to the MP3 AAC, WAV, and AIFF file support. Equipped with both analog and digital outputs and offering up to 48 kHz/24-bit audio resolution, the Pioneer XDJ 1000MK2 is ready to hit the big time whenever you are. True enough, the Pioneer XDJ 1000MK2 is an excellent choice for a stand-alone audio player. Full rekordbox integration, sophisticated touch screen controls, advanced search tools, on-demand hot cues, quantized looping and beat jumping — that’s quite a lot of versatility for any single machine. The top panel houses an illuminated USB port for receiving your flash drive full of tunes; the rear panel provides a USB port to facilitate the connection to your computer. 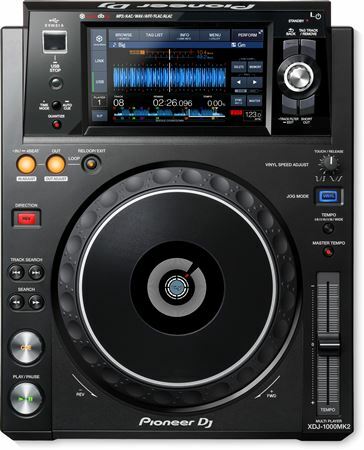 But that’s just the beginning with the XDJ 1000MK2. Using a common Ethernet LAN port, the exclusive DJ Link system allows you to build your own system using up to four Pioneer DJ Link products to achieve a completely unified performance system. Add additional players. Integrate a DJ mixer. Or introduce the exciting Pioneer Toriaz SP16 Sampling Workstation and treat your audience to a club experience like no other. Best part — you can find the Toriaz SP16 and all system-building DJ Link products from Pioneer right here at American Musical Supply! Hands down this was the best decision when purchasing a turntable for me. Nothing here but a top quality product at a great price. I'm very satisfied thank you very much. Crisp and clean transitions and easy to find my next selection. The touch screen is awesome!! Love these decks! If you are looking for the feel and performance of the club standard, but can afford the 2000mk2 decks, these are for you. I stopped using CDs a while ago, so taking a digital approach made sense for me. The features are amazing. In addition to rekordbox integration, the looping feature and ability to be smart about music selection make these power house players. I’ve been able to enjoy practicing at home when I want without planning. I’ve been able to kick up the creativity with more room to enjoy my music and less time getting bogged down with features I don’t use. Again the financing was a huge help. I’ve been waiting for years to buy new players and thought I’d never save enough. But AMS makes getting gear now possible! Very very happy to have these babies! I and continually amazed at how well this product works!! I was shopping around for cdjs or xdjs and I heard a lot of amazing reviews about this product. When I received my items from American musical, and started to actually play Trax I realize why the reviews were so good! This product is 100% what it's supposed to be an American music supply is 100% here for us the consumer! Thank you so much and I will continue my business with you!